It’s become clear in recent years with the surge of popular vegetarian cookbooks, restaurants, and trends that vegetables are anything but boring. I want to keep the vegetable loving momentum alive with my blog. All the recipes I create can be prepared as a vegetarian meal or can be complimented with non vegetarian ingredients. With that said, the vegetable I explored this week was celeriac or celery root. Celeriac is a root vegetable that has a subtle celery flavour. In the past I overlooked it because it looked cumbersome to prep and perhaps because of its unattractive appearance. After eyeing it down at the farmers market I realized it was time to welcome it with open arms into my kitchen. I had the perfect use for it! I love hummus. I eat it almost every day. I decided it was time to be creative and make a different kind of hummus. 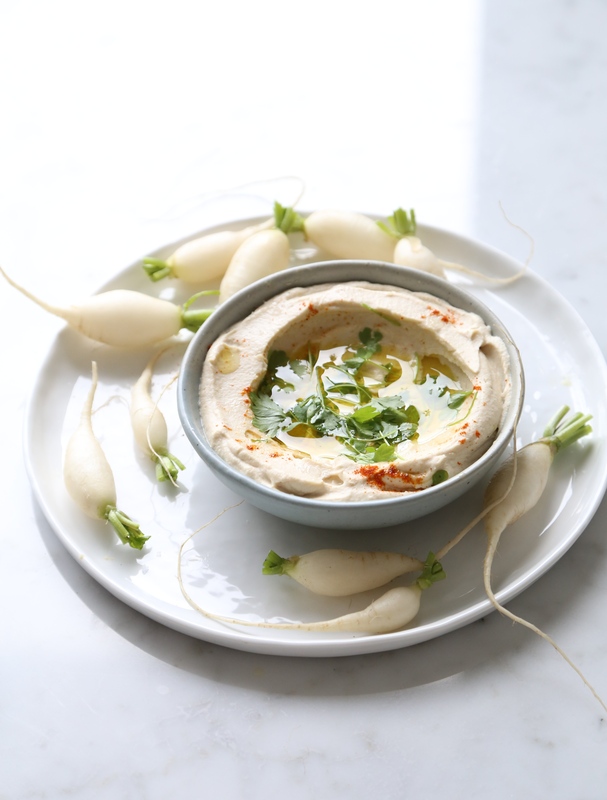 I easily swapped chickpeas, used in traditional hummus recipes, for celery root. Once celery root is boiled and blended with tahini it has a wonderful hummus texture but only lighter and smoother! This dip boosts the nutritional benefits of celery root and is a lower carb alternative to traditional hummus. What better way to sneak vegetables into your day? Move over chickpeas, celery root is here. Place the celery root in a pot and cover with cold water. Bring to a boil and simmer for 15 minutes, or until celery root is fork tender. Drain the celery root and reserve water. Place the celery root, tahini, lemon juice, olive oil, kosher salt, cumin, and paprika into a high speed blender or food processor. Blend until silky smooth. If mixture is too thick add 1 tbsp of reserved water at a time until desired texture. Serve hummus warm or cold with a drizzle of olive oil, and garnish with parsley and sprinkle of paprika. This entry was posted in Snacks and tagged gluten-free, healthy, hummus, nourish, Vegan, Vegetarian. Bookmark the permalink.